THERMAL ELECTRONICS CORP. is pleased to introduce the newest addition to our fast growing lineup of innovative products and accessories which started with the introduction of our acclaimed iPowerTower series of portable power generation products. Utilizing the most up to date engineering concepts for taking waste heat from any source and turning it into on-demand power, we are world leaders in extracting the greatest available energy from thermoelectric (TEG) modules. The 80 Watt TEG Interface System is the swiss army knife of TEG electronic interface products, packing a powerful number of features into a compact format. Using state of the art buck-boost DC to DC switching converters for power conditioning we can offer 12V or 24V operation, selectable from a front panel switch setting. 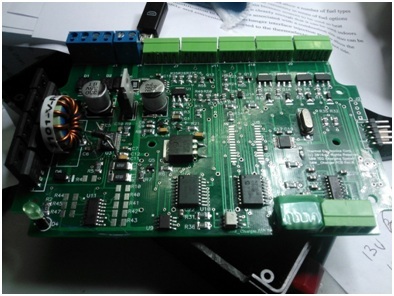 You can choose either a fixed 12V or 24V DC output just like a power supply, or with another switch the board will operate as a battery charger with constant voltage and constant current profiles for the most common battery chemistries. Unique to this system are a wide array of input and output connections such as analog and digital inputs for allowing this board to be used with other digital control systems including PLC controllers. Output connections are available for PWM control of external fans for cooling the heat exchange tower during high ambient temperatures and humidity levels. Also as a standard feature of this board, there is a connector to allow the software to monitor the coolant level and temperature of the heat exchange towers using our proprietary system to measure the coolant level of any tower. In the event of a low coolant level, a front panel LED will indicate this status to the user. Alternatively this product can be used with an optional GSM cellular modem to allow the system to send a text message to your phone. Designed to accept a single or dual TEG array. Alternatively this charger can be used with an appropriately matched and sized solar panel. Use it as a fixed 12V or 24V supply, or a full featured 12V /24V battery charging controller with automatic microcontroller based control for Constant Current/ Constant Voltage charging with float battery voltage charge termination. Built in support for widely available, low cost GSM wireless communication modems, allowing SMS text message capability. Receive a text message on your cell phone for low liquid level for example or send a text to the system to receive operational status. Liquid level and temperature sensors for reliable operation, with status LED error indication or receive a text message for low water level orincreased temperature. External DC cooling fan support, PWM driven and powered from the TEG input voltage will keep the tower liquid level temperature at the optimum point with higher ambient temperature conditions prevailing. External analog and digital isolated inputs and transistor outputs for interfacing with off-board systems or control systems. Expandable for additional functions or custom requirements with the additional of an expansion circuit board, where quantities are favorable to the addition of a custom designed hardware and firmware solution. Front panel switch selects operation modes for main operating conditions to quickly select various options. For more detailed setup and configuration a Windows compatible setup program will allow the user to set and change the parameters or view the system status. Can be used for remote data logging and collection if GSM modem is not used. Developed by FasterReach - Wordpress Development Toronto © 2018 | Shipping & Returns | All Rights Reserved | All pricing US Dollars (USD).